CURIOSITY Curiosity is a fact book about a Mars Rover (there are a lot of pictures in it). It is a good book if you want to read something quickly, however, I feel it should be more detailed and have less pictures. What it tells you is interesting so I might recommend it to someone who likes to learn about space. I give it a score of 6/10. I hope what Iâ?™ve told you has helped you decide whether you will read it or not. Will you read it next? I only just started it today but this book has already moved my heart. It just gives you the time to just read the book. It also feels like Iâ?™m actually taking to Curiosity. It just gives a inspiring message to all readers. I highly suggest you do have a read of this book. This is a fantastic book if you're interested in moons and Mars and space. I enjoyed it when they found out Curiosity (a space robot) landed on Mars when the people on Earth thought they'd lost him! Curiosity had a long journey because he had to go 350,000,000 miles! The illustrations are really good, I don't know how they can draw like that! The author must be really interested in moons and space, there is a lot of information so he must know a lot. I felt amazed that we had the technology to do something like this. Did you know that Curiosity travels 13,000 mph? Wow! It took 253 days until it finally landed. That's almost a year! I would recommend this book for people who like space and astronauts. Curiosity is a really good book. My favourite part is when Curiosity - the mars rover- lands on mars! My least favourite part is when it tells you how it was made. Would you like to readcp this book? From how Curiosity landed on mars to how many different rovers there have been launched in the last few years, this book has everything on mars rovers. Please read this book and tell me what you think. I rated this book a 4 because it could of had a few more fun facts because it was only telling us about how a robot got to the moon or space I found out a few facts out but I think they could of made a bit fun I didn't enjoy the book but you might I do recommend this book if you like space the moon and robots. This book is really good for people who like science and experiments. It tells you some parts of North America. Will we find out every thing about Mars? This book has a great start to it. As soon as I read it I was MINDBLOWN! Its full of facts of how they created it. It should be awarded BEST BOOK IN THE WORLD!! The author made me feel weird and confused because it looks like such a bigger place compare to Earth. This book has helped me to imagine more things. This book was very interesting and complicated at the same time. Its about a robot that has been invented by some scientists and is planning to go and take a trip to mars. If you like inventing things then this would be the perfect book for you. Do you like the sound of this book? I hope you enjoy this book as much as I did. Read on to find out more! This book is OK although there is too many pictures and not enough words. To be honest this book was a bit boring because there wasn't enough words. I would recommend this book to children that like space and Mars especially Mars its all about how a robot (Curiosity) was built, when you get into it its quite a bit fascinating how robot is built and how a robot survives! That's why I gave this book a 5. It was an interesting book about planets and rovers, So if you like space I recommend it. I like the book curiosity because itâ?™s more like a picture book then a page full of writing which I like but it wouldâ?™ve been better if there was a little more writing but overall itâ?™s ok so I gave it a solid 8/10. I like the book but there are far to many pictures . It needs more information and less pictures. I think this is a really great book because it teaches you a lot more about how mars rover are made also there are some really good facts about this! We liked this book because we are very intrested in mars rover and that is what curiosity is about.Also our theme in class right now is space!But it wasnâ?™t the best book in the world ,so thatâ?™s why we like curiosity. Are favourite bit of curiosity is the bit where it says the number 350,000,000 miles long.we also liked how the rover looked with silver. The othe things we liked was the part where it said is there anybody out there. Luke liked the bit when Lazarus were coming out of his eyes. 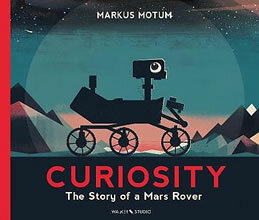 I like the book curiosity because of the planet mars. Curiosity is a great book to read. This story was formal; therefore it was filled with facts about how to make a robot. It has a few complicated words in it but that is only because it is very specific. I would recommend this book to children of the age of 10 or over.